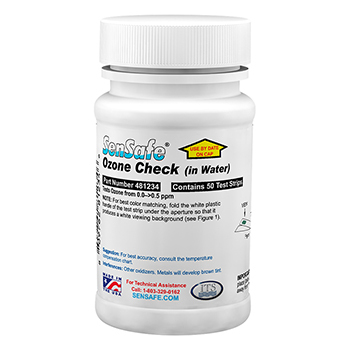 Ozone Water Test Kit is a uniquely designed test strip to check for levels of Ozone in water. Contains a bottle of 50 test strips. Result in 30 seconds. This test strip has a unique ability to test for low levels of ozone. The test procedure for this test is simple and quick. Just dip one test strip into a 50 mL (1.7 oz) or larger water sample. Move the strip in a back and forth motion for 10 seconds. Remove the strip from the water sample and shake once to remove the excess water. Wait 20 seconds and then match to the closest color.